Heather Lietz here; you may know me from the front desk at the clinic. A friend of mine had forwarded me some information about the Total Wellness Summit presented by Food Matters. I decided to join the free access to the online summit which took place from March 21st through March 31st. Each day they presented a different topic with videos of an interview with an expert, a documentary, a recipe, and a yoga or meditation practice. So much great information about health was being provided that I thought I would share the knowledge. Most people think of bacteria within the body as a cause of getting sick or developing certain diseases, but did you know that at all times there are actually billions of beneficial bacteria present within all of us? In fact, bacteria make up our microbiome, an integral internal ecosystem that benefits our gut health and the immune system. Recently, the scientific community has really come to embrace the important role that bacteria have in fostering a strong immune system and keeping us healthy. Not only are all bacteria not detrimental to our health, but some are actually crucial for boosting immunity, keeping our digestive systems running smoothly, our hormone levels balanced and our brains working properly. So what is the microbiome, why is it so important and how can we protect it? Let’s find out. The microbiome can be confusing because it’s different than other organs in that it’s not just located in one location and is not very large in size, plus it has very far-reaching roles that are tied to so many different bodily functions. Even the word “microbiome” tells you a lot about how it works and the importance of its roles, since “micro” means small and “biome” means a habitat of living things. It’s been said by some researchers that up to 90 percent of all diseases can be traced in some way back to the gut and health of the microbiome. Believe it or not, your microbiome is home to trillions of microbes, diverse organisms that help govern nearly every function of the human body in some way. The importance of our gut microbiome cannot be overstated: Poor gut health can contribute to leaky gut syndrome and autoimmune diseases and disorders like arthritis, dementia, heart disease, and cancer, while our health, fertility and longevity are also highly reliant on the balance of critters living within our guts. Throughout our lives, we help shape our own microbiomes — plus they adapt to changes in our environment. For example, the foods you eat, how you sleep, the amount of bacteria you’re exposed to on a daily basis and the level of stress you live with all help establish the state of your microbiota. Your diet plays a big part in establishing gut health and supporting your microbiome’s good bacteria. Research over the past several decades has revealed evidence that there’s an inextricable link between a person’s microbiota, digestion, body weight and metabolism. In an analysis of humans and 59 additional mammalian species, microbiome environments were shown to differ dramatically depending on the specie’s diet. Now that you can see why it’s critical to lower inflammation and support gut health, lets’s take a look at how you can go about this. •Fresh vegetables (all kinds): loaded with phytonutrients that are shown to lower cholesterol, triglycerides and symptoms of rheumatoid arthritis, Alzheimer’s disease, cancer, cardiovascular disease and diabetes. Aim for variety and a minimum of four to five servings per day. Some of the best include beets; carrots; cruciferous vegetables (broccoli, cabbage, cauliflower and kale); dark, leafy greens (collard greens, kale, spinach); onions; peas; salad greens; sea vegetables; and squashes. •Whole pieces of fruit (not juice): Fruit contains various antioxidants like resveratrol and flavonoids, which are tied to cancer prevention and brain health. Three to four servings per day is a good amount for most people, especially apples, blackberries, blueberries, cherries, nectarines, oranges, pears, pink grapefruit, plums, pomegranates, red grapefruit or strawberries. •Herbs, spices and teas: turmeric, ginger, basil, oregano, thyme, etc., plus green tea and organic coffee in moderation. •Probiotics: Probiotic foods contain “good bacteria” that populate your gut and fight off bad bacterial strains. Try to include probiotic foods like yogurt, kombucha, kvass, kefir or cultured veggies in your diet daily. •Wild-caught fish, cage-free eggs and grass-fed/pasture-raised meat: higher in omega-3 fatty acids than farm-raised foods and great sources of protein, healthy fats, and essential nutrients like zinc, selenium and B vitamins. • Healthy fats: grass-fed butter, coconut oil, extra virgin olive oil, nuts/seeds. •Ancient grains and legumes/beans: best when sprouted and 100 percent unrefined/whole. Two to three servings per day or less is best, especially Ansazi beans, adzuki beans, black beans, black-eyed peas, chickpeas, lentils, black rice, amaranth, buckwheat, quinoa. • Red wine and dark chocolate/cocoa in moderation: several times per week or a small amount daily. Antibiotics have been commonly prescribed for over 80 years now, but the problem is that they eliminate good bacteria in addition to cleaning the body of dangerous “germs,” which means they can lower immune function and raise the risk for infections, allergies and diseases. While antibiotics can save lives when they’re truly needed, they’re often overprescribed and misunderstood. Over time, dangerous bacteria can become resistant to antibiotics, making serious infections harder to fight. (4) Before taking antibiotics or giving them to your children, talk to your doctor about alternative options and the unintended consequences to our microbiomes that can result from taking antibiotics too often and when they aren’t needed. Co-enzyme Q10, carotenoids, omega-3 fish oil, selenium and antioxidants (vitamins C, D and E) can help keep free radical damage from disturbing micrbiota gut health. What Diseases Are Connected to the Microbiome? The microbiome is a lot like Earth’s ecosystems, meaning as its conditions change, so do the organisms that inhabit it. Microbes interact with one another within the community they live in (our gut), plus they change in concentration depending on their surroundings — which means your diet, lifestyle, use of medications/antibiotics and environment really impact your gut health. At the forefront of how your gut microbiome determines whether or not you’ll deal with various illnesses is inflammation. Inflammation is the root of most diseases. Studies show that an anti-inflammatory lifestyle is protective over brain neurons, balances hormones, fights the formation of tumors and has mood-enhancing benefits. While you might not think that gut health impacts your mood and energy much, think again. Gut-friendly bacteria can help manage neurotransmitter activity, which makes them natural antidepressants and anti-anxiety organisms. Instead of taking anti-inflammatory medications to manage illnesses like arthritis or heart disease, we’re much better off reducing inflammation in the body. • Autoimmune diseases (arthritis, inflammatory bowel disease, Hashimoto’s disease, etc. ): Autoimmune disorders develop when the body’s immune system goes awry and attacks its own healthy tissue. Inflammation and autoimmune reactions largely stem from an overactive immune system and poor gut health. Leaky gut syndrome can develop, which results in small openings in the gut lining opening up, releasing particles into the bloodstream and kicking off an autoimmune cascade. • Brain disorders/cognitive decline (Alzheimer’s, dementia, etc. ): Inflammation is highly correlated with cognitive decline, while an anti-inflammatory lifestyle has been shown to lead to better memory retention, longevity and brain health. We now know there are multiple neuro-chemical and neuro-metabolic pathways between the central nervous system/brain and microbiome/digestive tract that send signals to one another, affecting our memory, thought patterns and reasoning. (5) Differences in our microbial communities might be one of the most important factors in determining if we deal with cognitive disorders in older age. • Mood disorders (depression, anxiety): Ever hear of the “gut-brain connection”? Well here’s how it works: Your diet affects your microbiome and neurotransmitter activity, and therefore how you feel, your ability to handle stress and your energy levels. (8) Dietary changes over the last century — including industrial farming, the use of pesticides and herbicides, and the degradation of nutrients in foods — are the primary forces behind growing mental health issues like depression. Low nutrient availability, inflammation and oxidative stress affect the neurotransmitters dopamine, norepinephrine and serotonin, which control your moods, ease tension and raise alertness. It’s also a two-way street when it comes to your gut and mood: Poor gut health contributes to mood problems, and high amounts of stress also damage your gut and hormonal balance. • Learning disabilities (ADHD, autism): Our bodies are interconnected systems, and everything we put in them, expose them to or do to them affects the whole person, including their growth, development and mental capabilities. ADHD and other learning disabilities have been tied to poor gut health, especially in infants and children. (9) We are continuing to learn how our neurodevelopment, cognition, personality, mood, sleep and eating behaviors are all affected by the bacteria that reside within our guts. There seems to be an association between diet and psychiatric disorders due to metabolites of dietary components and enzymes encoded in our human genome that inhabit our guts. One of the most important factors seems to be establishing a healthy microbiome from birth, including a vaginal delivery ideally and being breastfed, which populates the newborn’s gut with the mother’s healthy bacteria. • Allergies, asthma and sensitivities: Certain beneficial bacteria lower inflammation, which lessens the severity of allergic reactions, food allergies, asthma or infections of the respiratory tract. (11) This means stronger defense against seasonal allergies or food allergies and more relief from coughing, colds, the flu or a sore throat. An anti-inflammatory diet helps prevent susceptibility to leaky gut syndrome and helps eliminate phlegm or mucus in the lungs or nasal passages, which makes it easier to breathe. Essentially, we need a higher ratio of gut-friendly “bugs” to outnumber those that are harmful in order to stay resilient and symptom-free. Unfortunately — due to factors like a poor diet, high amounts of stress and environmental toxin exposure — most people’s microbiomes are home to many billions of potentially dangerous bacteria, fungus, yeast and pathogens. When we carry around more pathogenic bacteria than we should, and also lack the diversity of protective bacteria we need, the microbiota suffers. The human microbiome is home to more than just bacteria. It also houses various human cells, viral strains, yeasts and fungi — but bacteria seem to be the most important when it comes to controlling immune function and inflammation. To date, researchers have identified more than 10,000 different species of microbes living in the human body, and each one has its own set of DNA and specific functions. There’s still lots to learn about how each strain of bacteria affects various parts of the body and how each can either defend us from or contribute to conditions like obesity, autoimmune disorders, cognitive decline and inflammation. You might have learned in school when you were younger that all human beings actually have very closely related genetic codes, even though we are all so different-looking as a species. What’s amazing is that each of our gut microbiomes is vastly different. One of the most amazing things about the microbiome is how different it can be from one person to another. Estimates of the human gene catalog show that we have about 22,000 “genes” (as we normally think of them) but a staggering 3.3 million “non-redundant genes” in the human gut microbiome! The diversity among the microbiome of individuals is phenomenal: Individual humans are about 99.9 percent identical to one another in terms of their host genome but usually 80 percent to 90 percent different from one another in terms of the microbiome. While some bacteria contribute to diseases, many do not. In fact, there are lots of bacterial strains we could benefit from having more of. At the same time, having certain diseases can negatively impact the microbiome, although we still have a lot to learn about how this happens exactly. The more we can come to understand how bacteria in the microbiome affect our genes and predispose us to diseases, the better we can personalize treatment approaches and prevent and manage diseases before they’re life-threatening. •Microbiota are the trillions of bacterial organisms that live inside our bodies. The whole community of these bacteria is called the microbiome. 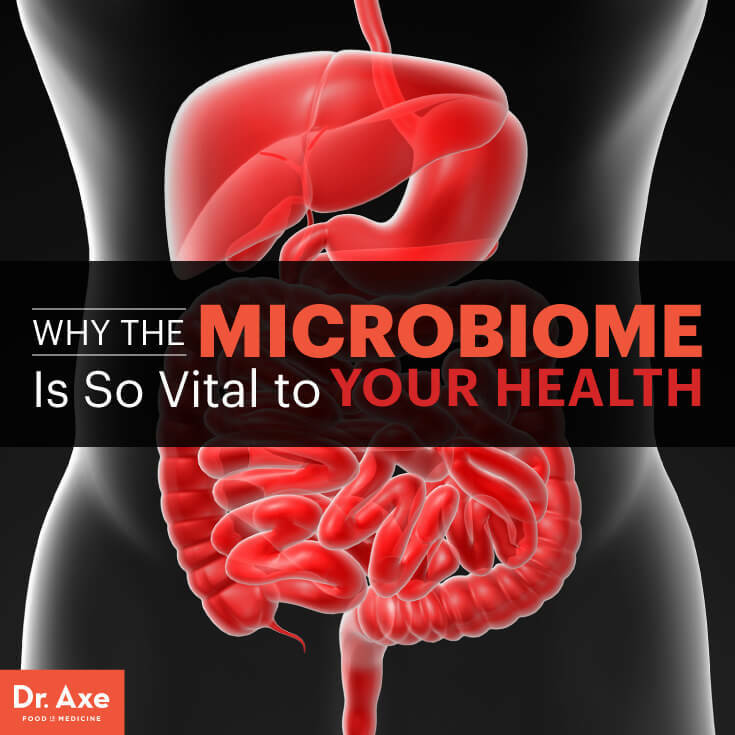 •Our gut is a central location of the microbiome, where the large majority of bacteria live. •Poor gut health is tied to nearly every disease there is in some way, because this is where much of our immune system lives and where inflammation often begins. 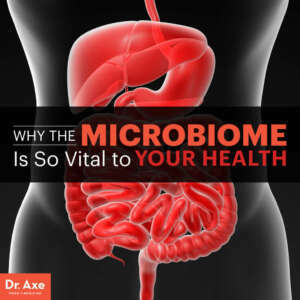 •By improving your diet, eating plenty of anti-inflammatory foods and probiotics, lowering stress, and exercising regularly, you can support your body’s microbiome.